It's been an intense affair in this weeks round of champions league, that has brought us late comebacks, grand comebacks, Danish success and big disappointments. Furthermore we've been spoiled with shocking boot changes, goal heroes and stubborn boot-lovers. 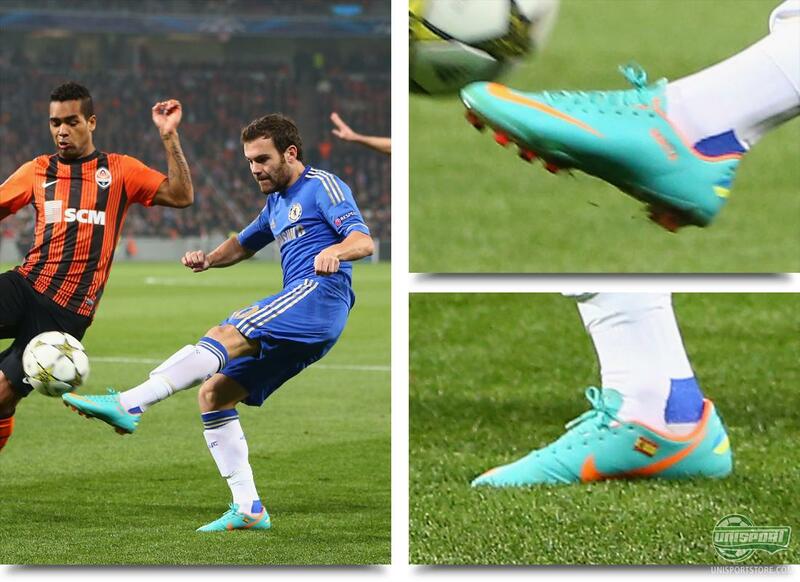 Juan Mata (Chelsea) - Nike Mercurial Vapor VIII ACC Retro/Total Orange/Challenge Red Quite surprisingly the defending Champions-League champions ran into a 2-1 defeat to Shaktar Donetsk. Before the game Juan Mata had scored 6 goals and provided 6 assists in his last 6 games wearing his Nike Mercurial Vapor VIII ACC Retro/Total Orange/Challenge Red, but that was apparently not enough to justify a call up to the Spanish national team. Is that unfair or do Spain have too many good offensive midfielders, for Juan Mata? Charlie Mulgrew (Celtic) - Nike Mercurial Vapor VIII Seaweed/Volt The Scottish champions long looked like stealing a point at the Camp Nou, but with a goal in the first halfs added time and then later one in the games dying embers, the Catalan giants came out on top. While studying the Scots and their team, we spotted Mulgrew, who had chosen to hop in a pair of Nike Mercurial Vapor VIII Seaweed/Volt, which actually was a colourway only intended for Cristiano Ronaldo. Olivier Giroud (Arsenal) - Puma Evospeed 1 White/Red/Blue The Londoners didn't have the same luck in their comeback-efforts and suffered a 2-0 defeat to German, Schalke 04, who with goals from Huntelaar and Afellay, secured an important away victory. We did however notice that Arsenals French striker, who is among Pumas front-figures for the EvoSpeed-Collection, had not chosen to play in he latest colour variation. He is stubbornly holding on to the launch model and we don't really understand why, because they haven't really been producing as many goals as hoped. Javier Hernandéz (Manchester United) - Nike Tiempo Legend IV White/Green There's on the other hand always goals to be found in Chicharito or Little pea as it translates to. He was the architect behind yet another impressive Manchester United-comeback, who came from being behind 2-0, to end up tipping the game 3-2 in their favor. Two of the goals came from the gentleman in question and then one from Jonny Evans. The small Mexican was still wearing his Nike Tiempo Legend IV White/Green and until we see another Tiempo in white, it's unlikely we will see him in anything else  He only ever play in white boots. 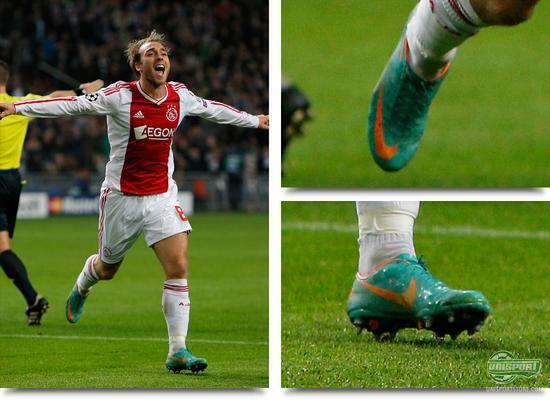 Christian Eriksen (Ajax) - Nike Mercurial Vapor VIII ACC Retro/Total Orange/Challenge Red The Danish prodigy had a great night on the international scene, as he orchestrated a 3-1 victory against the Premier League-Champions. After several near-misses, Eriksen found the net with a deflected shot past Joe Hart and could celebrate putting his team further in front. The lead was defended to the end and Ajax are now in charge of their own Champions-League fate, in The group of death! Mario Götze (Dortmund) - Nike Mercurial Vapor VIII ACC Retro/Total Orange/Challenge Red Another leading talent on the European scene, also had an excellent evening, as Dortmund beat Real Madrid. Goals scored by Robert Lewandowski and Marcel Schmelzer were enough to secure the win for the Germans and not even a well crafted goal by Ronaldo could knock them off course. We naturally kept a sharp look directed at Götzes feet, because of his mysterious choice of boot in Germanys latest world cup qualifier training, but this time the blackout-enigmas were left at home and it was back to normal for Mario Götze, as he wore his Nike Mercurial Vapor VIII ACC Retro/Total Orange/Challenge Red. Prince Poldi has earlier in the season been playing in the newest coulourway of the Adidas F50 Adizero Silver/Orange, but now he's turned back to the older White/Lime/Black. They, unfortunately, didn't produce any goals, but none the less the former Köln-player has had an exceptional start to life in his new club, where he's scored a series of super goals. Which of the two colours would you have played in could you choose? The Spanish midfield maestro had some trouble unhinging the Celtic defense, but he in the end got a ball through for Andres Iniesta, who in his current form, is never going to miss. He did this wearing his Adidas Predator LZ Blue/Red which he notably is still using. He is still to start using the Champions-League version, but you have to feel there's still time yet. 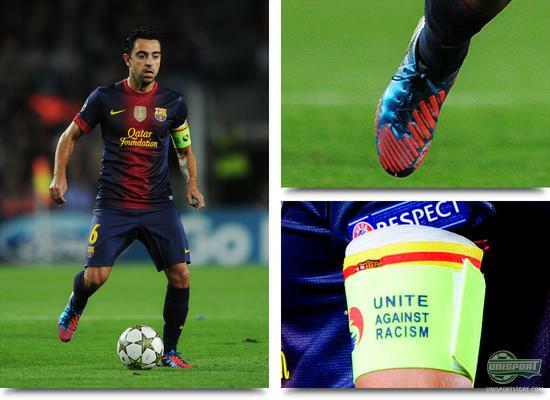 It was quite amusing too that, Xavi had elected to wear two captains armbands; one Uefa-armband and one Catalan-armband. He is apparently refusing to play without the latter and we think that's good style. Alexis Sanchez (FC Barcelona) - Nike Mercurial Vapor VIII ACC Custom Retro/Total Orange/Challenge Red The Chilean offensive-profile has, like his Spanish team-mate Pedro, had his Nike Mercurial Vapor VIII ACC customized. Both have in common that they prefer the old Vapor VII-studsystem over the newer VIII system. Personally we like the VIII better, but the two quick-men obviously see something in it we don't. Have you tried them both? Which do you like the most? HOLEY MOLEY! This could end up being a very expensive evening for this fellow. The German started of easy with a pair of Nike Mercurial Vapor VIII ACC Retro/Total Orange/Challenge Red and they were even involved in Real Madrids equalizer, were he was responsible for the assist. We don't know what went through his mind at half-time, but he felt like changing into a pair of Adidas Predator LZ Blue/Red. 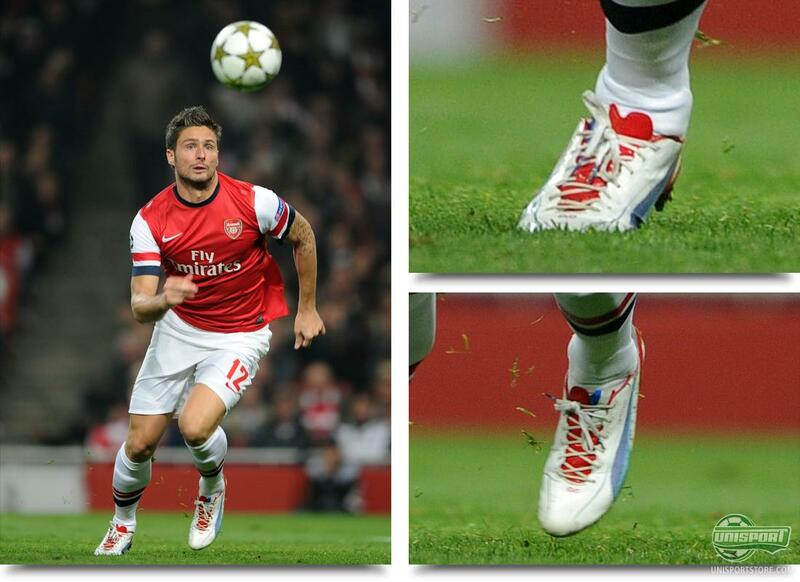 Like we mentioned in an earlier update, then playing in an Adidas boot could end up costing him 150.000 per game. - That's a lot of money! 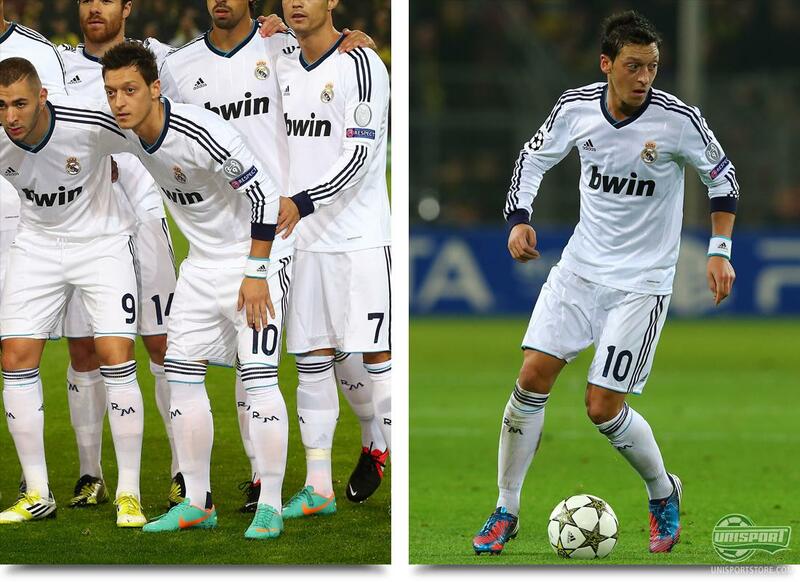 Mesut Özil can now call himself the owner of the worlds most expensive football-boots. It was an eventful few night of European football, that were rounded off by last nights games in the Europa-League. They brought just as many great boot spots, but no one could top Özils 150.000 boot change. What do you think was his motivation for this apparently ludicrous move? Will he end up an Adidas man? Tell us in the comments-section down bellow.